Walter Imahara, at age 8, sat alone on a swing in a playground at his elementary school in New Orleans. 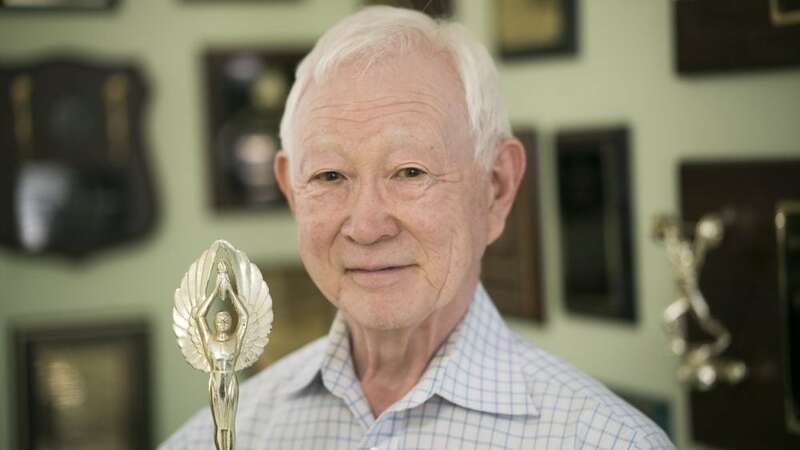 Since his family had moved to the Crescent City in 1945 at the end of WWII, following their internment in two concentration camps for Japanese-Americans in Arkansas, Walter and his siblings faced relentless bullying. He had chosen the same swing nearly every day with the same result; one child had singled Walter out. He would ridicule Walter, sometimes with slurs like “Jap” and often attacked Walter in erratic bouts of physical abuse. Walter cast a slim shadow and, as a smallish child, didn’t stand much of chance against the kids when they ganged up on him. This particular day was different, though; Walter had a simple plan. When his tormentor approached him, Walter leapt up, reared back and let the bully have it with a well-timed hook. “I took a swing and knocked him out pretty good,” Walter recalls. The kid backed off and for the next couple of years Walter gained a slight reprieve from the antagonism. Walter Imahara is very matter-of-fact with his memories, without any sense of victimhood draped around his and his family’s saga. Perhaps these moments and earlier traumas in the Japanese internment camps paved the way for Walter’s eventual triumphs and helped shape his competitive drive, like when he won the very first national championship for UL Lafayette (then SLI) in any sport. As the “only Asian kid on campus,” as he puts it, those wins turned out to be quite a feat. His three national collegiate championship victories in Olympic weightlifting — and a fourth in which he took second place — were firsts for the university. But Walter wasn’t just the only Asian kid on that campus. He was also the very first Japanese-American to graduate from UL. These championship wins sparked the beginning of a period of nearly successive victories for the UL Olympic weightlifting team for over a decade. It would go on to become one of the most successful collegiate Olympic weightlifting teams of the 20th century with eight championship wins during the period of 1959-1971 (the championship was not held in 1969), the bulk of which is the subject of my forthcoming documentary, The Ragin’ 12. The Imahara family immigrated to the United States from Japan in the late 1800s and settled in California. This would make Walter a third generation Japanese-American. His maternal grandfather enlisted in the U.S. Navy in 1889, an action that would initiate a familial devotion to serving a nation that confined their family in prison camps during WWII. The four Imahara boys, Walter included, all enlisted in the U.S. Armed Forces. Walter’s family owned a large 60-acre vineyard near Sacramento, Calif., when the Japanese bombed Pearl Harbor on Dec. 7, 1941. His father, James Imahara, toiled tirelessly on their farm and had turned it into a successful family business. Following the attack and President Franklin D. Roosevelt’s Executive Order 9066, their land, livelihood and their identity were all taken from them. Their family name was replaced by a number on a dog tag: 8663. Roughly 120,000 people living in the United States of Japanese ancestry — two-thirds of them American citizens — were rounded up and sent off to relocation camps further inland. Walter’s father had heard that Japanese-Americans were being penned up with the intent of protecting them from any violent acts that could befall them should anyone seek vengeance for Pearl Harbor — that somehow their barbed wire enclosures were for their own good. James hoped this was the case. Walter was almost 5 years old when his family was boarded onto a train. The window shades were drawn to prevent the passengers from seeing their surroundings as they journeyed deep into the country’s heartland. His family was eventually delivered to one of the two camps in Arkansas they would be forced to live in for three years, the entire duration of the war. When Walter and his family were resettled in the camps, his father realized that he might have been wrong to believe that they were being imprisoned, “for their own good.” This was further evidenced by his father’s observation that the soldiers positioned around the camp had their machine guns pointing inward and not outward. Walter’s father felt betrayed. James Imahara was 37 at the time of the large-scale Japanese relocation efforts. “He lost everything he had worked his entire life to build up; it took him many years to recover from that loss,” Walter says. The War Relocation Authority’s concentration camps were cramped and had very little privacy, but room was made for makeshift schools and churches. It was here that Walter’s mother, Haruka, was indoctrinated into the Christian faith. Fifteen years later the majority of the Imahara family followed suit. Half a century more and remnants of their former Buddhist traditions are still preserved. Walter crafted a public Japanese gardens in St. Francisville where Buddhist principles of respecting all living things, especially as it pertains to the deer that wander across the 54-acre property, are actively maintained. Imahara’s Botanical Garden has painstakingly been converted over five years into a lush landscape inspired by his family and Japanese heritage. “Our custom of working with nature as a whole is one of the main reasons we don’t run the deer off and respect their presence here; that’s important to us,” Walter says. Last November, Walter, at a spry 79 years old, traveled to Japan to retrieve his family’s Buddhist shrine. It took the U.S. government 45 years to send Walter reparations for his jingoistic imprisonment as a child. His earlier plan of completing his undergraduate studies in engineering was thwarted by the math and chemistry requirements. “I wasn’t that sharp on grades,” he explains. What Walter did have, however, was an ample athletic ability that nearly went unnoticed until his time at the university. “I didn’t know too much about Olympic weightlifting until I met Mike Stansbury at SLI in spring 1956,” he recalls. Stansbury was the owner of the only gym in Lafayette at the time, Mike Stansbury’s Health Club. “The first thing Mike asked me was if I knew who Tommy Kono was. I said I hadn’t heard of him. Mike said, ‘Because you look like him,’” Walter says. Kono was an Olympic gold medalist for the United States, a Japanese-American, and a former inhabitant of the Tule Lake Japanese internment camp throughout WWII. Kono and Imahara would later form a lifelong friendship that lasted until Kono’s death in April 2016. Stansbury later explained to Walter that he was referring to Kono’s and Imahara’s similarities in the curvature of their spines, something Stansbury felt would help Walter hold the weight during a lift. Stansbury’s legacy is a substantial one in the weightlifting world, and particularly at SLI where he was responsible for (as both participant and coach) the team’s second place standing at the National Collegiate Weightlifting Championship in 1956 and its first place win the following year. Following Walter’s three first-place achievements and record-breaking accomplishments during his time at SLI, Walter competed with the New Orleans Athletic Club. There he trained alongside David Berger, an Israeli national who would later be killed by terrorists during the 1972 Munich Olympics. It was around this period that Walter felt compelled to join the U.S. Army. He received his first marching orders during the Berlin Crisis of 1961: a posting in Dachau, Germany. Around 32,000 people were killed at the Dachau concentration camp during WWII. “What we went through in the U.S. in those camps was nothing compared to what happened in Germany, nothing,” Walter says. Please click here for the complete articile, including photos.